After flying the green quadcopter for over 6 months, I wanted to build new multirotor using all the knowledge I had earned. The reason I built a hexacopter was to improve the payload capability as well as increase the reliability compared to the quad. The biggest disadvantage with having many rotors is that it makes the copter less agile. But since I am not interested in making sharp turns and flips, this is not a problem for me. For this project I got the Ardupilot Mega 2.6 with external compass and telemetry modules. This system has lots of functionality, and new software is constantly being developed by the community. This made it the perfect system for my copter. 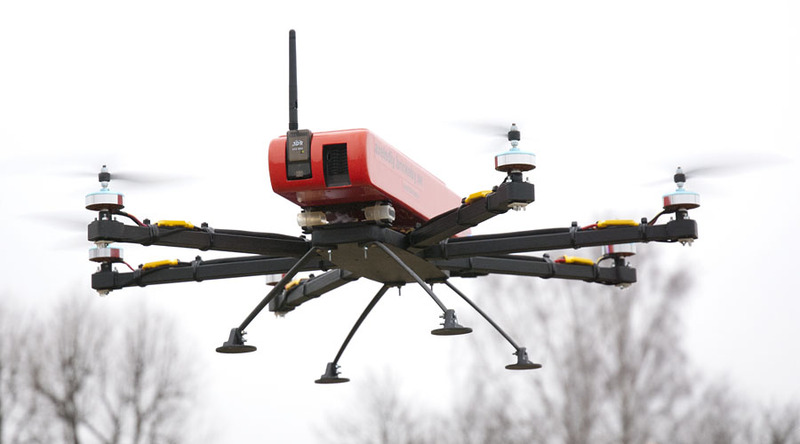 The Ardupilot also gives the copter increased reliability due to features such as “Loiter” and “Return to home”. The Ardupilot also provides a god battery monitoring system using a current sensor. I equiped this hexacopter with a brushless gimbal to stabilize the GoPro camera, and a large battery for long flight times. I hope that a gimbal will give me a more stable video, even in windy conditions. 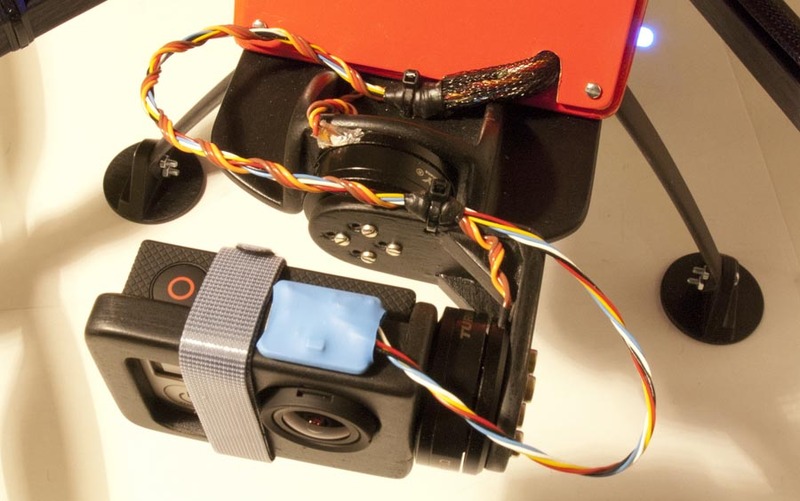 To save money and make it a little more challenging, I bought two brushless gimbal motors and a control board separately and built the gimbal myself. A gimbal only stabilizes low frequency vibrations. Some other system is needed to dampen motor vibrations, and for this I will use silicon hoses in a similar way as I did on the old quadcopter. One thing that I liked with the old quadcopter is the large fuselage with all the electronics protected inside. Therefore I will keep this design in the hexacopter as well. I also installed my FPV equipment on this hex, although FPV is not my main interest with multirotors. I used the same DT750 motors as the quad since I did not have any problems with them and they seem to be pretty efficient. This later turned out to be a mistake. After about ten flights one of the motors failed and started smoking when hovering at a few meters altitude. I was able to land one the other five motors. 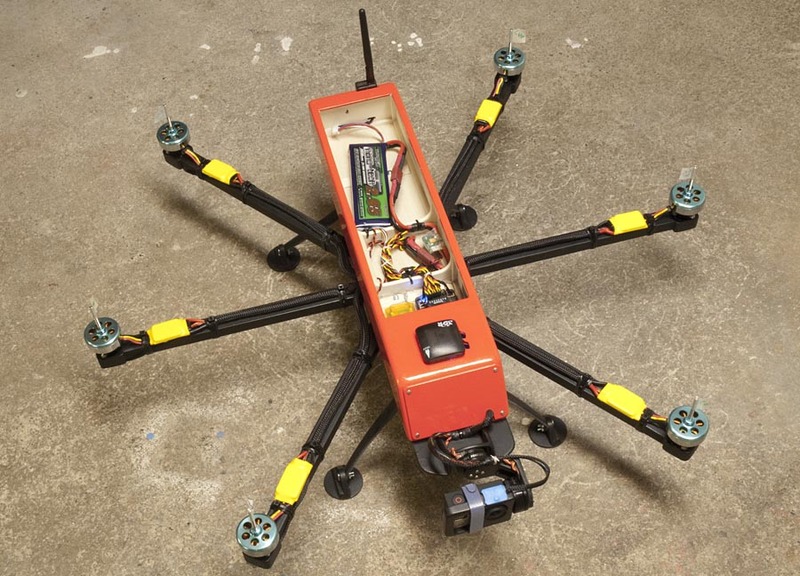 Since this hexacopter became a little to heavy, It was not possible to maintain a hover using five motors. And that was the hole point of building a hexacopter. The copter also proved to be ineficient, It did drawn more than 30 amps on the 3 cell LiPo while hovering, this resulted in a flight time of only 6-8 minutes, which is to bad in my opinion. Therefore I retired this hexacopter an came op with a new quadcopter instead (page about this coming soon). I did made plans for this hexacopter, bus since I am not happy with the design I will not publish them here. Email me i you are interested.